We have all probably had the misfortune of having a severe case of sunburn, were the simplest touch to our skin causes pain for a day or two. This is followed up by an unsightly peeling of one's now dead sunburned skin. On this page we will explain sunburn and list current treatments and view points. Sunburn normally only affects the outer most layer of our skin ( First degree Burn ) and in extreme and repeat prolonged sun exposure may result in secondary burns and blistering. Sunburn cannot cause third degree burns, and is highly unlikely to cause any form of skin scarring. Sunburn can occur in 15 minutes or less sun exposure with people who are fair skinned and sun-sensitive. The effects of excessive sun exposure are unfortunately only observed 2 to 5 hours after sun damage to the skin has occurred. 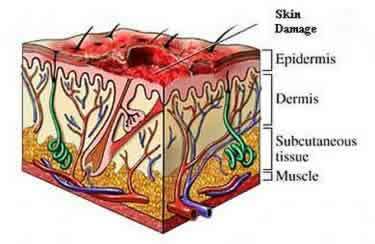 The inflammatory, reddening of the skin is most evident only 12 to 30 hours after excessive sun exposure. Leave Blisters from Severe Sunburn Intact to prevent secondary infection. 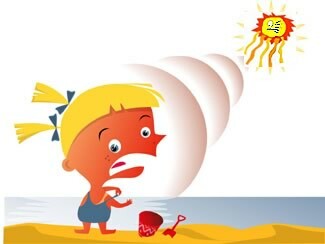 If your kids show any symptoms of severe sunburn one is adviced to consult a doctor immediatly. A cool ( not cold bath ) is effective in reducing irritation and pain levels. Increase liquid intake for 2 to 3 days. Take Asprin for pain and inflammation ( Kids are adviced to take Ibuprofen containing or other physician recommended pain killers ). Ensure all areas of sunburn are not exposed to further sun damage until healing has occurred. Physician issued oral steroids or corto-steroids have shown to reduce severe symptoms. Vitamin A C and E containing creams have a beneficial effect on the sunburned areas. Aloe Vera and other Succulent herbs ( eg. Bulbanella Species ) are reported to have positive effects. Cold Sugarless tea: Cold ceylon tea is rich in tannins which might have positive effects on healing your sunburn. Treatment of sunburn,help with sunburn and pain relief from sunburned skin.